Trick or treat? Looking ahead to Halloween in the Archives! Autumn is a fantastic time of year in Suffolk. The colour of the landscape, the crisper mornings, and the sight of wildlife hunkering down for the colder weather all herald the changing season. And of course, autumn means Halloween! The archives in our 3 branches are crammed full of spooky stories and terrifying tales fit for an autumn fireside on 31st October; below are 2 examples to fire your imagination. Record Office staff member, Ivan Bunn, has studied extensively the story of two poor Lowestoft women, Amy Denny and Rose Cullender, who were accused at Bury St Edmunds assizes (by their relatively rich and well-to-do neighbours led by Samuel Pacy) of causing carts to overturn, the death of a child, bedevilling cattle, and lice infestations. Records available in the Suffolk Record Office and in the National Archives piece together their tragic story. On March 10, 1662 they were found guilty of various crimes of witchcraft and hung on Monday 17th March 1662. Documentation from this trial was used in evidence thirty years later at the notorious Salem trials, when many more lost their lives as a result of the witch-hunt of 1692. Ivan has examined in detail the lives of the two women, their neighbours and the circumstances, beliefs, political concerns, hysteria and prejudices of the time that caused such fear and hatred resulting in their ultimate deaths. Their story includes leading personalities of the time from the fields of law, medicine and politics including Sir Matthew Hale, the presiding judge, and Sir Thomas Browne, the verifying doctor. After being arrested by Hopkins, Lowes was taken to Framlingham Castle to be swum in the moat. He floated in the stagnant waters, proving to the Witchfinders and spectators his guilt. 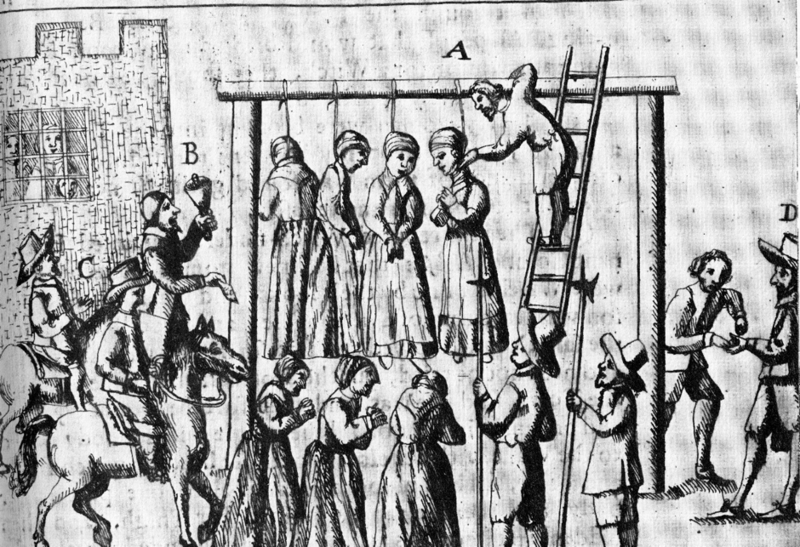 From here he was taken to the assizes at Bury St Edmunds, where he was tried, found guilty and hanged as part of the largest witch trial held in England where 18 people were executed in one day.